Q: Let me delve into your pro experience as well as college for this next question. 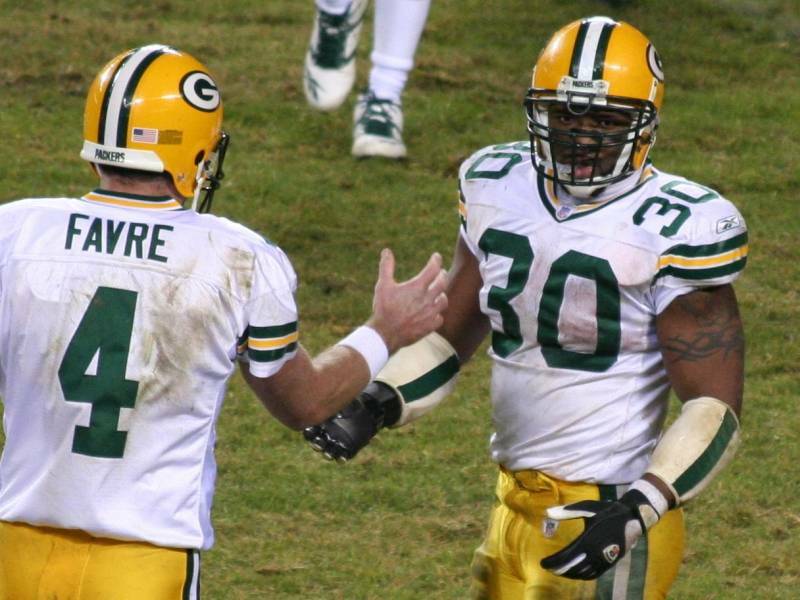 You‘ve been in the same huddle with not only Tommie Frazier -a hell of a warrior and one of the most successful college quarterbacks in history- but also Brett Favre, perhaps one of the most successful pro quarterbacks we’ve known. And then you’ve been led by not only the incomparable Coach Solich and Tom Osborne -who’s the ultimate, almost paradoxical servant/leader- but Mike Holmgren, too, who happens to be one of the most successful pro coaches in the latter half of the twentieth century. In your interactions with all of these people, is there some intangible that you can coalesce into one or two items worth noting? Do these people share a common trait? AG: From my perspective? What makes anybody do what they did? I say they all have that one intangible, which is: You can approach them about anything. You can talk to them about the weather or the weekend’s upcoming game. There was no intimidation. I’ve been a rookie and I’ve been with new head coaches in the NFL, and if coaches don’t have social skills they can’t even walk down the hallway and look you in the eye and say, “Hi, how are you doing?” And you had that with all the coaches there and in my time in the League. 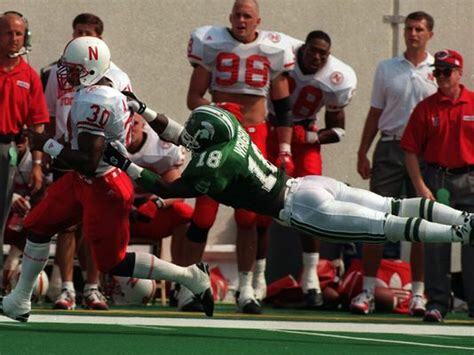 Brett had that, Tommie had that in Lincoln. If you don’t have the plain old social skills that your mom and dad should have taught you you’re not gonna have the respect and support that you need to have in a team sport like football. Q: So in other words, it comes down to maximum accessibility and minimized ego? AG: Right. You’re not thinking, ‘I did this. I did that. These guys have to listen to me.’ No. It doesn’t matter what you’ve done if you can’t get a team to follow you or play with you or for you… a lot of games are won or lost right there. Q: Interesting. That’s a great little nugget of wisdom, Ahman. I was expecting something about a ‘fire in the belly’ or a grand sense of purpose or something of that nature, not the openness and ability to connect, to bond, to communicate at a most basic level. So as we wrap up here I want to ask, do you have a favorite play or a favorite game? And all them games, really -even the ones we lost- were all meaningful because we were doing something special. From my freshman year and my first game with Oklahoma to the first game I started against Missouri, and then as a freshman playing in the national title game? You don’t get any better than that. Q: I’m thinking back…. Lawrence played and scored a few touchdowns and then you go into the game, and then was it Jay Simms who almost scored a touchdown in the final seconds, too? AG: Yep. And then Coach Osborne had them kneel down with the ball. Q: (laughs) Ahman, one of my favorite plays you were involved in was the game versus Colorado where Tommie was essentially tackled and he coughed up a throw… and you caught it for a jaunt down the sidelines. AG: Yeah, yeah, that was my freshman year. There were pretty much two plays: that one that I think you’re talking about, he actually got sacked. He pretty much was sacked. AG: No, that was common. That was the crazy thing: he would call these plays and we’d go over the first fifteen. And every game -from the time I got there to the time I left- we would talk about it the night before and it would happen just the way he talked about it. The whole scenario would break down to, “This is the play we’ll use in this third and short situation. And if we don’t get a first down we’ll score a touchdown off of it.” It was textbook. Q: Do you recall any memorable practices from back in the day? 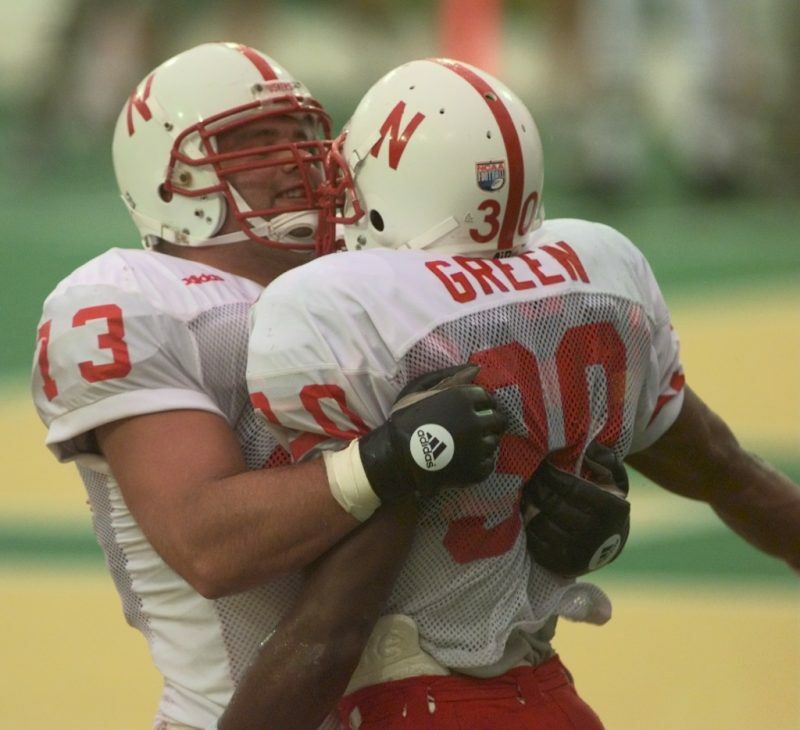 AG: Oh yeah, I’d say with Coach Osborne… you remember how he used to kind of stand in the middle of the field for practice so he could see the offense on one side and the defense on the other side? AG: And it happened a couple of times where he was down there on the field and he got taken out: A receiver running a route and looking back at the ball, he’s not looking ahead for Coach Osborne? That would happen a couple times. He’d get up and you would think he’s going to say something, and it would be nothing. He’d just put his hat on. Now, we knew he wanted to say something, but he never did. All the time I’ve known him, he never said one little word or one bad word, period. It was amazing to me, as a college coach to be able to not do that. It was amazing. That was a feat in itself. Even though we were a perfect team on the field on Saturdays, we had bad practices. He’d be cussing us out and using words like ‘malarkey’ and ‘gosh darnit’. But just to think: he wouldn’t let it out. It was amazing. AG: Basically, yeah. (laughs) That basically was it. Q: So I have to ask, any memorable off-field stuff worth sharing? AG: Well, there’s another Coach Osborne story: It was my freshman year and we had just finished practice over in the Cook Pavilion, and it was me, Frankie London, Kareem Sears and Eric Johnson, we’re all sitting down taking a load off because we just had a good, long, hard practice. 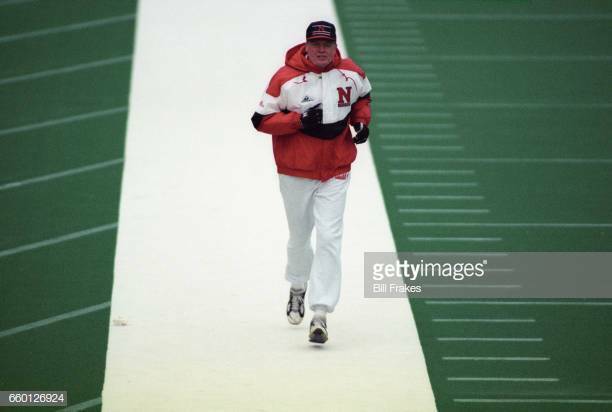 Well, if you remember, Coach Osborne would jog after every practice. He’d run like a mile or two miles after practice or whatever. So we’re at the Cook and he’s running along the north wall, the north sideline, and we’re sitting by the west door where we used to leave out of on the way back over to the locker room. We’re sitting there and just talking about practice or whatever and we’re not even really looking at Coach Osborne, but we just kind of glanced over. And when we glanced over he tripped. He tripped and fell! Well, it wasn’t funny because he tripped and fell… what was funny about the trip and fall was that he tripped, he fell, rolled over, his hat fell off, he picked up his hat, and got back up all in one motion. (laughing) He fell, his hat fell off, hit the ground and he rolled like he was burning on fire -“Stop, Drop and Roll”- and pops up and just picks his stuff up and keeps on running like nothing happened! And we… as freshmen we just looked at each other, we grabbed our mouths and grabbed our pads and like ran out the door as fast as possible so we could laugh. We were like, “Oh, my God! It was like he just fell, but didn’t break stride. He fell, rolled, got up, picked his hat back up, and kept jogging.” He was what, sixty then? It was amazing to see him do that. Q: He still had the grace…still showing the moves of a 1955 Nebraska Athlete of the Year? AG: Yes, he hit the ground, rolled, got up and put the hat back on like nothing had happened. It was hilarious. That was the funniest part! He was okay, so we could laugh. It wasn’t the fact that he was hurt, so it was perfectly fine, but the way he did it was hilarious. Q: That’s priceless, Ahman. 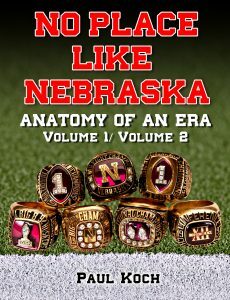 I have to end with one last question: Thinking back on those days, how did the Nebraska football experience make you a better man? Any lessons you take with you to this day? Any way of summing it up? AG: I would just say from a football player’s standpoint that, as a team, if you don’t know each other you’re not going to win. Family: you’ve got to have that family connection. Q: Would you use the word ‘love’? And I say respect. Because you ain’t got to love every guy, but as long as you know what a guy’s purpose is on the team? Even if the guy is a punter, you respect him because you know if he doesn’t punt that ball more than thirty yards he’s not doing his job. And he knows that. And the guy holding the ball on the PAT, he knows the purpose of his job. And if he doesn’t get that ball set for the kicker to kick the field goal? As long as you respect every player and every person on the team, you’ll go far. And that’s what Coach Osborne made us realize: Everyone was important. Every player, no matter if that player just played one snap or if that player was Tommie or me, or before I got there, a guy like Darin Erstad. Coach Osborne made sure everybody was basically accounted for and accountable for their actions, because everybody played a factor in winning that game. Q: There are no unimportant people? Preparation: Ahman touched on the Friday night’s before the game, how the first fifteen offensive plays were always scripted. 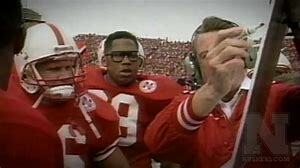 Like a Vegas poker pro, Tom Osborne and staff were looking for ‘tells’ -a defense’s tendency or an indication of weakness in player positioning or scheme- and later capitalized on what they saw through masterly cunning and spotless execution. Part of preparation is eliminating the unknown, especially for a horde of nervous post-adolescents, and just knowing the fifteen plays they would automatically run the following day must have been a soothing balm to the butterflies in the stomach during the night’s interim: “…it would happen just the way he talked about it… It was textbook. 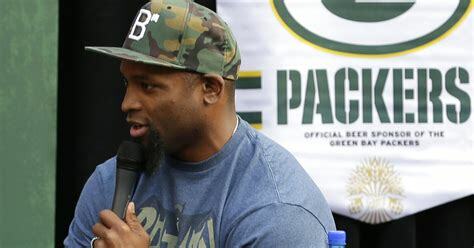 And that right there in itself made us even play harder, because we’re being coached by a guy who knows what the heck is going on.” Whether in football, religion or leadership in general, the instrument of faith isn’t a worthy one unless it’s focused on the proper object. Possessing a sure knowledge of an offense developed, enhanced and perfected over the years, Coach Tom Osborne was such a man when it came to football and life. Also, Ahman said something extremely, incredibly, mind-blowingly profound. It was his, “And all them games, really -even the ones we lost- were all meaningful because we were doing something special.” I’d supposed the memory of losses were valuable only as a reminder of the sting of defeat, something to draw upon for further contests and offseason preparations only. But, in retrospect, he was correct in a more profound way, because they helped put life in perspective for those kids: that it consists of more than just wins and losses on a 12 game schedule. Those losses -few as they were- served as a reminder that the family, the unity, the belief and respect built up and maintained was the truer accomplishment, championships being a mere offshoot of that culture and climate.” Everyone was important.” Important enough to treat someone as a peer, an equal, a fellow human being no matter where they stood on the depth chart or pay scale: “If you don’t have the plain old social skills… you’re not gonna have the respect and support that you need to have.” Everyone was important. Even a freshman running back.